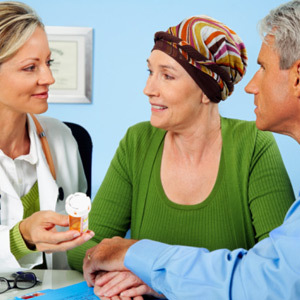 As a cancer patient, you know how important radiation and chemotherapy are to overcoming the disease. But these treatments often come at a price to other aspects of your health, including your teeth and gums if the treatment target includes the head or neck regions. Radiation and chemotherapy are effective because they target and destroy cancer cells. Unfortunately, they may also kill non-cancerous, healthy cells; in the mouth, for example, they can damage the cells in the salivary glands and disrupt their ability to produce adequate saliva flow, leading to xerostomia (dry mouth). This could seriously affect your teeth’s protective enamel shell. As we eat or drink, our mouth’s pH level can become too acidic. Acid is your enamel’s primary enemy because it causes the minerals in the enamel to soften and dissolve (de-mineralization). Saliva neutralizes acid and replaces much of the enamel’s minerals. Without adequate saliva flow, the enamel will tend to erode over time. You can further aggravate the situation if you routinely consume acidic foods and drinks, like sipping energy drinks or soda during the day. Once the enamel is gone it can’t be replaced naturally, and the teeth will be in serious danger of tooth decay and eventual loss of function and appearance. To avoid these consequences you should take steps during cancer treatment to reduce your risk for xerostomia or other unhealthy mouth conditions: limit your consumption of acidic foods and beverages; use mouth rinses to counteract acidity and inhibit bacterial growth; and promote saliva flow through medication. It may be, though, that enamel erosion and subsequent tooth damage is unavoidable. In this case, you may need to consider restorative options with artificial crowns or other cosmetic enhancements — not only to improve your appearance but also to protect your natural teeth from further damage. Before considering the latter, you should undergo a complete dental examination to assess your condition and make sure you have adequate bone and gum support, and any dental disease under control. From here, we can go about restoring the attractive smile that may have faded during your battle with cancer. If you would like more information on oral care during and after cancer treatment, please contact us or schedule an appointment for a consultation.